Milestones can productively assist project managers in monitoring project process and walking on the right path. Simply refer to this article to learn about what is a milestone in a Gantt chart and some other key points. What is a Milestone in a Gantt Chart? Generally, unlike any other basic components in project management, milestones are specific points in line with your project cycle used to monitor project process and follow the right path. Milestones normally exist at intermediate stages without duration. It is a quite common way to be used to mark any significant activities in your project in the shape of a diamond. Real-time examples of using milestones in your project cloud be the establishment of a new website. You may need some major points like approving new UI design or posts etc. Easy-to-use: Milestones are very simple to understand and flexible to use. It shows you how the project is progressing based on the initial plan with the comparison between the estimated completion date and the actual finish date. Hence, project managers or team supervisors can productively distribute resources or assign tasks according to milestones. Informative for stakeholders: Milestones offer a top-level view of the project key dates and events to those who are not familiar with your project, i.e. stakeholders and/or sponsors. For example, for monthly business meetings, project managers can report projects only based on milestones to efficiently manage stakeholders'; expectations. Assist in noticing risks: Placing milestones can assist in identifying potential bottlenecks, especially for those generated by your external partners. Motivation: Setting milestones could efficiently motivate your team because of the sense of accomplishment. Team members can celebrate, or take a quick break just before the upcoming work pressure. When to Use Milestones in Gantt Charts? Important dates of project kick-offs for professional meetings, business events, financial checks, product rollouts and more. Noticeable deadlines of your projects for both digital and offline tasks such as software development completion, or the deadline for the submission of business partnership applications. Dates to receive resources from, or negotiate project details with your business partners, for example, undertake external reviews, or receive equipment from an external supplier. In the case of multiple teams or departments working on different task priorities in a project. 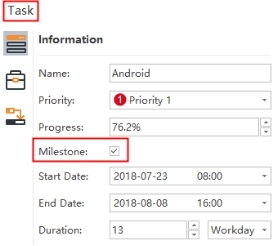 Any Other Key Reminders of Using Milestones in Gantt Charts? Team communication: Before setting milestones, you may unpack all the basic steps and communicate with different roles in your team for more details like types of resources, budgets, duration and more. Frequency: Normally, milestones can be set on a monthly basis, but project managers should adjust the actual frequency according to specific workload and the availability of resources. Setting names: Milestones should be set with straightforward names, but not ones that reflect they are tasks. Therefore, something like 'Sign a contract to move to the next step' is not appropriate, but 'Step B starts/finish' is fine. In this case, the action of signing files should be considered as a single task with a duration. You can also set numbers with letters for the names of your long-term work breakdown project milestones. More examples of suitable milestones names are 'test/program completed/approved'. 1. Do these milestones meet the requirement you initially determined? 2. How far will the current milestones be completed? 3. Are there any unexpected problems in terms of external or internal aspects? Besides, some project management software can also assist you in identifying any these kinds of problems based on built-in auto-generate resource status reports. How to Create a Milestone in a Gantt Chart Software? 1. Click to select the task which you want to set as a Milestone. Click the Milestone button on the Home tab. Go to the Right Side Panel and check Milestone in the Information section of the task panel. 3. Check out the diamond milestone icon that shows up in your Gantt Chart View.